An execution device designed in ancient Greece. 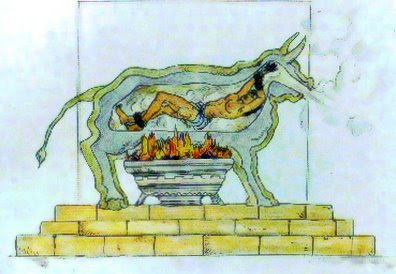 Perillos of Athens, a brass-founder, proposed… the invention of a new means for executing criminals; accordingly, he cast a bull, made entirely of brass, hollow, with a door in the side. The condemned were shut in the bull and a fire was set under it, heating the metal until it became “yellow hot” and causing the person inside to roast to death. [Furthermore] the bull [was] designed in such a way that its smoke rose in spicy clouds of incense [and so that] tubes and stops [converted] the prisoner's screams [into] sounds like the bellowing of an infuriated bull. Read the above link if you like, but believe me that I provided the best bits here. Thank the ellipses and brackets. Do bears come in the woods? There's a Discovery Channel program I've seen on more than once that has a bit on this. Nice cheesy little CGI re-creation. Check out a clip of it here. I feel like it may have shown up on a History Channel program as well at some point.